I won't go so far as to say that Mirror Mirror is a better movie than The Fall, but it may be my favorite film he's made so far. From beginning to end, it's a thoroughly entertaining movie that I would not be surprised to find out that parents enjoy more than their kids. It's not necessarily a meta fairy tale in the vein of the Shrek series or Stephen Sondheim's Into the Woods, but it's certainly very self-aware. It's like a fairy tale being told in a world where fairy tales exist. The film opens with a brilliant animated prologue, narrated by the evil queen (Julia Roberts), in which we're given the entire back story on her deceased husband, the king, and her step-daughter Snow White (Lily Collins). When we return to present day, it is Snow White's 18th birthday, and she finds herself being treated hostilely by the queen, who is being pursued by a Baron (Michael Lerner) keen to unite their two kingdoms. In the woods outside the kingdom, a handsome prince, Alcott (Armie Hammer), traveling through with his servant Renbock (Robert Emms) are attacked and robbed by a group of savage bandits, who turn out to be a band of seven dwarfs. Wishing to see what's become of the kingdom her evil stepmother has been running, Snow White sneaks out of the castle to find a society in decay. She's very upset by this, as the kingdom of her childhood memories was a happy place. When returning to the castle, she comes upon Alcott and Renbock, and frees them from the shackles they were placed in by the dwarfs. 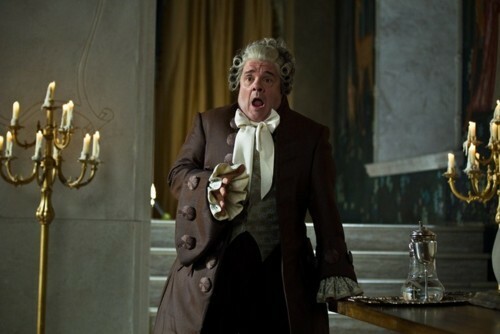 Alcott arrives at the castle, and the queen is immediately smitten with him, ordering her servant Brighton (Nathan Lane) to announce to the kingdom that there will be a royal ball to introduce the prince to the kingdom. I was thoroughly worried that the film would, at any moment, devolve into a nonsensical assortment of pop-culture references and fart jokes, but thankfully, this is not that kind of film. It's not only very sweet, it's very smart, and the script by Melissa Wallack & Jason Keller is incredibly clever. It's the kind of film that makes you wish every revisionist take on a fairy tale put this much thought into where to put twists on the original material, as opposed to just making everything a twist on the old tale. This is a familiar story with no reason to be told anew, but the film adds just enough newness to the proceedings to make it feel fresh and new as opposed to superfluous. Some of the changes I really enjoyed were the way they dealt with the queen's magic mirror, the giant marionettes that attack the dwarfs, and the spell the queen puts on the prince to make him fall in love with her. The design of the film is fantastic. 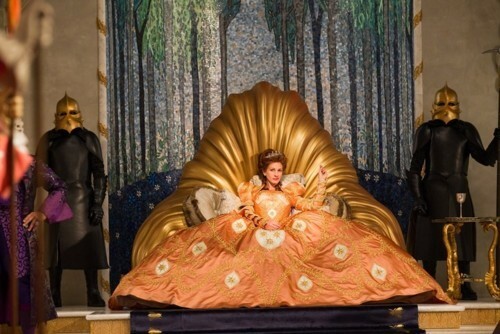 The film world lost a costume design giant earlier this year with the passing of Eiko Ishioka, and while it's sad to say this was her final film, her designs are as gorgeous and varied as always. 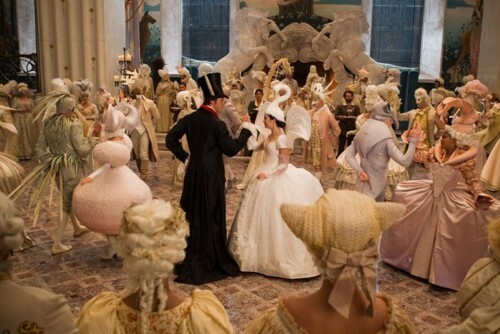 She doesn't just work in one style, there are multiple stylistic looks to the film from the first ball that is almost all white to the wedding sequence near the end where the costumes are a kaleidoscope of colors. The production design by Tom Foden is also great, and I can only hope this film will be remembered for its design excellence come Oscar time. As far as the performances, they are all pretty great. Roberts is an actress I'm not usually fond of, but here I think she is wonderful. She appears to be having a great deal of fun, which certainly helps as it never allows her to take herself to seriously. Hammer is also great fun, and I'm looking forward to seeing more from him in next year's The Lone Ranger as I think he's a rare commodity in that he's incredibly handsome and also a very talented actor. Lane & Mare Winningham, as one of the women who works in the castle, are also terrific and a welcome sight in any film. They're so underused these days, that their mere presence is cause for excitement. Collins isn't as terrible as people have been saying. She's a tad bland, but it's never distracting. She's certainly got a lot more in both the looks and charisma departments than the other actress playing Snow White this year, and frankly, she's got the least flashy role, and she does a serviceable job in it. The film really and truly belongs to the dwarfs though. These seven actors are all phenomenal, and they really get a chance to shine here. They're all very recognizable and you'll remember Woodburn from his time on Seinfeld as Kramer's stand-in partner, Povinelli from It's Always Sunny in Philadelphia, and Prentice from Harold & Kumar go to White Castle. This is sadly the first film since Terry Gilliam's Time Bandits to really give actors of this stature the kind of characters to really sink their teeth into, and they are all well-written, fully realized characters, not a bunch of sidekicks with funny quirks. I truly hope we don't have to go another thirty years before someone writes roles this good for these actors again. That face pretty much sums up my surprise at how much I liked Mirror Mirror. I knew my five-year old daughter Clementine would enjoy it, and I snap up any chance I get to take my kids to see films by directors I love, but I was truly surprised by how much I liked it as well. As a parent, I get dragged to a lot of bad movies, and maybe a mediocre movie looks artificially good as a result, but I'm savvy enough to know the difference. This is not a movie for everyone, and I have to say that if there's not at least one element of what I mentioned that sounds intriguing to you, the film will do nothing to change your mind. But if you're a fan of Tarsem, and you were disappointed with the lack of imagination in Immortals, you'll be pleased by this return to form. Lastly, just in case you were wondering, the Scarface reference from the trailer was rightly deleted from the final cut. I'm not sure who that joke was for, but it's not in the film. I think that if you give yourself over to the film, you'll be surprised by how taken with it you'll find yourself to be. It's really great, and it's always nice to be surprised by films nowadays, especially when you consider how many disappointments we've gotten right out of the gate so far this year. Snow White and the Huntsman has its work cut out for it now if it's going to be the best Snow White movie this year, and something tells me it's just not up to the task. Especially now that I've already seen a great Snow White movie this year.